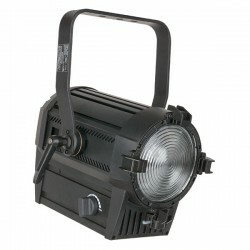 The Performer 2000 LED Fresnel brings a new revolution in theatre spots with LED light source. With only 16 LED's the fixture can create over 5300 Lumen / 10.000 lux (@ 2m). For optimal flexibility the Performer 2000 LED Fresnel has a motorized zoom by DMX which can be adjusted between 13 and 41 degree. On the backside it has full connectivity with 3 and 5 pole XLR connectors as well Neutrik Powercon in and outputs. It's built in DIM4 dimming technology ensure smooth dimming like a traditional tungsten fixture. The Performer 2000 LED Fresnel is a true workhorse for theatres, TV-studio and rental.